There is something about the printed page that computer text files have not been able to replace for me. Even though I can take my laptop most places, including to bed, so far I haven’t found anything like the convenience of being able to gently close a book and lay it on a nightstand just as I begin to sink into an unconscious stupor. There’s nothing to turn off, and if I accidentally drop it the consequences are usually slight. So even though the complete Philip Schaff edition of the Church Fathers is available on the Christian Classics Ethereal Library web site, and even though I also have a copy on CD-ROM (though I can no longer find it offered on the Ages Digital Library web site and Amazon lists it as “Currently Unavailable”), I didn’t actually make a habit of reading it until Christian Book Distributor‘s price for the complete set came down from the stratosphere to within arm’s reach of my budget. At first I found myself using it primarily as a reference, sticking the occasional Post-It® flag on a page bearing a particularly memorable or important quote. Sometimes I would become particularly involved in a passage in, say, Justin Martyr‘s writings. Other times I would hunt down a reference to check for the context when I encountered a citation from, say, Vincent of Lérins. But then I chanced upon the homilies of John Chrysostom (c. A.D. 347-407), and my enchantment was immediate. In contrast to other ancient biblical expositors I’d read, Chrysostom came across as lucid and timeless. This is a reflection of the theological company he kept. Chrysostom’s exegesis of the Bible, in line with the Antiochene school of which his writings are the best representative, has been characterized as logical, literal, sober, restrained, commonsensical, grammatical, detailed and historical. This “matter-of-fact exposition of the text” (Pelican, 191) is the hallmark of the Antiochene school, in distinction from its rival, the Alexandrian school,2 which emphasized the allegorical, the symbolic, the spiritual meaning of the text. So now, instead of a random volume snatched from a shelf because of its somnolence-inducing effects, more often than not I find myself sitting up in bed in thrall to one of the greatest orators of church history as he expounds the Apostle Paul’s epistle to the Romans. His commentaries read more like transcriptions of sermons than technical treatises because that is precisely what they are. 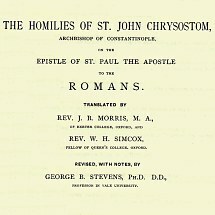 The name Chrysostom was actually given to him because of his reputation as a great preacher. In Greek it literally means “John the Golden-mouth” (Ἰωάννης ὁ Χρυσόστομος, Iōannēs ho Chysostomos). 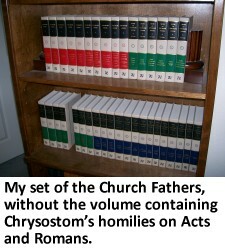 This will probably not endear me to the hearts of many whose project it is to postmodernize Christianity, but I think one of the reasons I enjoy Chrysostom as much as I do is because his style is so much like that of a 20th century biblical commentator, even in the commonly-available 19th century translation that often consciously mimics the King James Version. The printed sermon has a goodly heritage among evangelical Christians, and in the right hands this genre has done much to edify the church. While Chrysostom’s strong ascetic emphasis3 would have presented difficulties, given the likelihood that he received early training in oratory (Mitchell, ibid., 29) and given his “unabashed devotion to Scripture” (ibid., 33), he would probably have felt right at home in the evangelical church of the past quarter millennium, at least in terms of finding an outlet for his spiritual gifts. While my Roman Catholic upbringing has made the concept of church feast days familiar to me, I’m assuming that “the memorials of the holy martyrs” to which Chrysostom refers remain a feature of the Eastern Orthodox church calendar, and yet I haven’t been able to determine its precise identity, if there is one. The liturgical calendar of the Greek Orthodox Archdiocese of America has many dates set aside for commemorating various martyrs, and it could be that Chrysostom is referring to more than one memorial. But I grieve and am pained, that all people do not know this man, as much as they ought to know him; but some are so far ignorant of him, as not even to know for certainty the number of his Epistles. And this comes not of incapacity, but of their not having the wish to be continually conversing with this blessed man. The first basic cause of this spiritual indolence was the simple lack of desire. They did not wish to spend as much time familiarizing themselves with the text of Paul’s writings as they wished to do other things. Chrysostom was not simply trying to be harsh here; he was trying to head off the reply that he knew Paul so well because he was so intelligent. But such was not the case. For it is not through any natural readiness and sharpness of wit that even I am acquainted with as much as I do know, if I do know anything, but owing to a continual cleaving to the man, and an earnest affection towards him. For, what belongs to men beloved, they who love them know above all others; because they are interested in them. Intimate knowledge of a person—knowledge of his thoughts, attitudes, and desires—comes from spending a significant amount of time with that person. The only way in which one could spend such time with a deceased person, such as Paul, was through his writings. If those whom we are trying to know are still alive there are other means available by which we may know them. But however it is that we may become acquainted with people, it does not become a close acquaintance unless we think about them, and have a special place for them in our hearts. Paul himself modeled this. There are several references like this in Paul’s epistles—places where he tells those hearers (or readers, if this introduction was not delivered orally) whom he knows personally how much they mean to him—although the theological significance of these references is seldom brought out in expository messages. Chrysostom himself doesn’t actually bring it out, because he’s simply using the verse from Philippians to make his own point, which is not unreasonable.4 He is exhorting his audience to bring their whole selves to the text the way they would carefully attend to the words of a close friend. But since the greater part of those who here gather themselves to us, have taken upon themselves the bringing up of children, and the care of a wife, and the charge of a family, and for this cause cannot afford to all events aroused to receive those things which have been brought together by others, and bestow as much attention upon the hearing of what is said as ye give to the gathering together of goods. For although it is unseemly to demand only so much of you, yet still one must be content if ye give as much. People who deal with the ordinary demands of life are busy. Chrysostom recognized this. In his day it seems they often came to church so preoccupied with their responsibilities and pursuits that they were less-than-attentive to the reading of Scripture. Today we have fewer excuses. We are a vastly more literate society, and now we even have readings of the entire Bible recorded for us on CDs. (Who listens to tapes anymore?) And the vast array of competent commentaries, study Bibles, and other materials makes familiarity with Paul’s epistles and the rest of Scripture something that is easily within the grasp of everyone. But how many have actually grasped them? We’re still in the middle of an exceedingly long paragraph in Chrysostom’s introduction. I’ll pick it up from this point in my next post on this topic. This entry was posted in Bible, Chrysostom, Early Church. Bookmark the permalink.